Mid-1940s. Inscribed “To Dr. Ress. With great affection and appreciation. Doris Dowling (yr. new daughter)”. Doris Dowling has followed her sister, Constance, from Broadway to Hollywood, where she puts in terrific performances in The Lost Weekend (1944) and The Blue Dahlia (1946). Around the time this photo is taken, her affair with director Billy Wilder is an open secret in Hollywood circles. He separates from his first wife in 1945 and gets a divorce in 1947 but will later claim he never intended to marry Doris. In 1947 she will decamp with her sister Constance to Italy, where she will find the finest role of her career – as a jewel thief’s girlfriend in the Italian Neo-realist film Bitter Rice (1949). On her return to the US she will continue to work in movies and television. 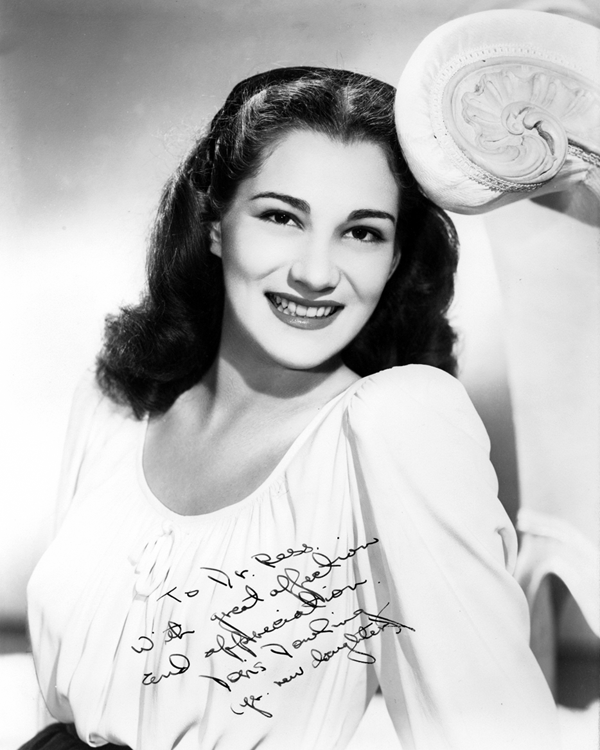 In 1952 she will become jazzman Artie Shaw’s seventh wife but the marriage will last just four years. She will go on to marry a United Artists executive and then a publicist, to whom she will remain married until her death in 2004.